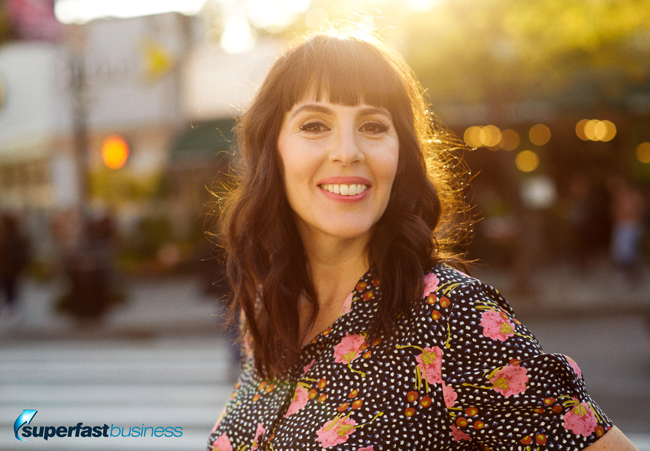 Laura Belgray helps people create businesses that are an extension of themselves. In our interview with her, she talks copywriting, the recent shift in tone of content approach, how your flaws can actually sell you, and much more. 07:08 – Are emails still important? 09:51 – Long or short? 11:42 – What about PSs? 38:41 – What’s with the name? James: James Schramko here, welcome back to SuperFastBusiness. This is Episode 582 and I’m speaking with Laura Belgray. Welcome to the call. Laura: Thank you. Thanks for having me. James: So we got introduced through a mutual friend over there in New York, who I met in Texas of all places, and she said you’re doing some interesting things with some of the celebrities we would know online and in the business marketing space. I think you co-created a copywriting course with Marie Forleo, is that right? Laura: That is correct. That’s funny, when you said celebrities, I wondered who you were going to say, because I forget that about her. Yes. We have a course called The Copy Cure, and we created it in 2015 and it’s evergreen, so it’s there, ready for the taking. James: So with the way that you operate now, I believe you’re doing copywriting work with people, but that’s a pretty boring way to refer to that topic. I think you’ve mentioned a different way you’d say that you help people find words that work, and you’re helping people put more personality into their brand. Do you think there’s been a shift in the last five years in the way that people are approaching copywriting and emotional storytelling? Laura: Yeah, actually I do. For better or for worse. Because when you know, when I got in the business, that is of helping entrepreneurs, (I’ve been in copywriting for years and years since the 90s) but when I started getting into this weird little world, there was almost nobody who was writing with personality, who had any kind of attitude in their copy. Everything was very businesslike. And I don’t know if you know IttyBiz, Naomi Dunford? James: Oh I’ve heard her name. Laura: Yeah, she’s one of the like, kind of old school from back then. She was the only one – somebody, I think Marie, said, you should look at IttyBiz, because she is writing fun stuff but for business. And that was the only person that she could come up with who was writing in a really personable way and had any kind of attitude to her brand. And now, I’ve found that the pendulum has really swung all the way, like too far in a way. And so now there is a ton of like, super sassy, hey gorgeous, kind of copy out there, at least in my circle. James: Yeah. Your circle, is that, I imagine it’s closely related to that, what I would call the female market that Marie Forleo’s really fostered. And when I said celebrity, I’m really sort of saying in our world, in the online space, she really has made a name for herself with big launches of her products; her training schools have generated lots and lots of students. And I imagine they would be great customers for your collaborative course. Laura: Yes, they are a perfect audience for it. It’s a lot of people who I’d say will really respond to the word “aligned” which I think is a little bit woo woo jargon, but I understand what it means. I understand why they like it. A lot of people really, really just jive with the word aligned because they love the idea of a business that lines up with who they are. And I get that, and I do, too. I like helping people create a business that feels like an expression of themselves, where there is no real disconnect. I think we all grow up with the idea of business being like, Hello, I am a business and I have a briefcase and I sit at a desk and I have a tie and I have a beeper and it has to be formal and very buttoned up. That doesn’t feel like us. James: I remember that generation, with beepers. I had a beeper. Laura: Did you wear khakis? James: You know, at one point I think I had some khaki, we’d say beige-coloured trousers, but a shirt and a tie. I was actually working for General Motors and I was repossessing cars, which is really hard with a beeper. So my job would be to go to someone’s house and ask them to make a payment or else we’re going to have to put their car into storage, which is a nice way of saying you’re going to repossess their car. Laura: I got to get to a payphone. James: I’d have to go across the road and knock on the door and say, “Excuse me, could I borrow your phone to call a tow truck? I need to get a car picked up.” And they’d be confused and I used to hope that later the neighbour would never find out that their next door neighbor aided and abetted the collection of their vehicle. It was a barrier. Technology was a barrier. But certainly, if you go to a conference these days, and we talked about this in my previous episode with Ezra Firestone about the youth at these conferences, they’re definitely a different generation. I mean, I feel blessed that I grew up without a phone grafted to my palm of my hand. So there has been this big shift, and now it’s quite funny when I see some of these young people dressing up in suits but they’ve never actually been to an office job. They’re just getting all snazzy and preened up for stage. It’s quite interesting. Laura: They’re wearing suits by choice. James: I know. I couldn’t wait to get out of mine. James: In fact, The whole hoodie represented the breakout. It was like that was my home freedom uniform, and the suit represented prison. And I don’t wear ties, you know, haven’t for 10 years it’s been since I quit my job. I mean, I don’t wear shoes or a shirt most of the time where I live, but it’s really interesting to see that there will be changes. The one thing that doesn’t seem to change is that a compelling story still sells. Laura: Yeah, absolutely. I think a compelling story, a collection of compelling stories, I think that if you’re able to express all the things about you, share the details of your life in some way through your business with your audience, they get to know you. They get to feel like they know you without ever having met you. That’s the beauty of it. James: That’s kind of the premise of Gary V, isn’t it, to document the journey and to share and report on what’s happening? And it seems to be how you take advantage of technology. I think you mentioned to me, you’ve been focused on emails a fair bit lately. Do you think emails are still important? Laura: I think email is more important than ever. I am a little bit obsessed with it, mostly because I always felt like, ‘Oh man, if I could only just get paid to write emails,’ because that’s the thing that’s most fun for me, then I would have the perfect business. And I realized lately, ‘Wait, I do get paid to write emails,’ because that’s the thing that really pays me in my business. One reason email’s so important is because it’s essentially distraction-free. I mean, nothing is distraction free. There are always a million apps, especially if you’re on your laptop. You can still see your texts and you can still see your browser and you can open up Facebook while you’re in email. But when you are in an email, there’s nothing else popping up, like as opposed to when you’re on Instagram or Facebook. You can post something there, and when someone’s reading it, their eyes are going to get called away by something else in two seconds. But if they’re reading your stuff in an email, there are no dings and boops and red lights or anything in that email. So that’s a big deal. And there’s also the fact that email’s one-to-one, if you’re writing it right. A single email should be written in a voice to one person. And so, whereas like, Facebook is kind of like, you know, you’re going ding, ding, ding at a party on your glass and saying, like, “I have an announcement, everybody”, and everyone, you know, some of them will quiet down and listen and some will not, when someone’s reading an email from you, it is from you to them. You know what I mean? Laura: Yeah. A bunch of you. James: Is this a broadcast? Laura: Right. People think about the audience that they’re writing to when they write the email. When they’re writing a newsletter, broadcast to their list, they think, ‘Oh, I’m writing this to hundreds or thousands of people,’ and they forget that there’s one person, the person reading it is by themselves. They’re not gathered round the computer with a whole group of their friends, or like a mob of your audience. They’re by themselves reading your email. It is one-to-one, and it should be written one-to-one. Laura: I didn’t know that. James: It’s a really obvious thing when you think about it, but if you switch from group talk to singular talk from the platform, you will have people come up to you afterwards and say, I felt like you were speaking just to me. And that’s by using the word you instead of that group talk. So it applies to emails, it applies to speaking from stage. And I do see it broken a lot. It’s like in movies when people, you know, when they when they break down that fourth wall, it really does interrupt the flow of things and that’s a trap. So there’s an interesting one. I think emails are so important that for my onboarding diagnostic of coaching students, there’s about four sequences that I look for that must be in their system, and quite often they’re behaviorally based. When somebody does something, that will trigger a certain sequence. And I found that even a simple email in some of those cases, like what Dean Jackson talks about, the nine-word email, is very personal, and it’s short. So emails don’t have to be long or fancy to get a result. If they’re sent at the right time and they’re engaging and they get a response, then they could be equally effective. Do you find that you mix it up much? Do you have different styles that you go to as your sort of 80:20? Laura: That’s funny, well after what you just said, I’d like to add that nobody ever hit unsubscribed because your email was too short. Let’s put it that way. So absolutely, they can be short. Mine are usually too long. I usually set out to write a really short one, and it gets longer and longer and longer. And my audience doesn’t seem to mind, just because I try to make it all compelling and tell a good story. And that’s why it gets long, because I want to write the whole story. But I do try to mix it up, and I like to remind people, because a lot of people say, well, I’d stopped emailing my list because I can’t think of anything to say to them, like I don’t have anything worth writing them about, and I don’t want to write them something stupid and I don’t want to write them nothing. And so I always remind people that all it takes is just one little, it can be one tip, one quick story. One thing that you found that you’re really into this week that you wanted to send their way. You can pretend it’s an email to your best friend that you would send them, like if you shoot a friend an email, it’s not usually going to be super long. It’s going to be like, “Hey, thought you’d be interested in this – check it out. Thought of you.” And it can be just as simple as that. James: Yeah, that’s an excellent tip. And do you typically use PSs? Laura: Yeah. I use them up the wazoo. I use them too much. But people love the PS. I know people, a lot of people scroll to the PS. Some of them are just waiting to see what you’re going to use the PS for. And I find that if I use a link a couple of times, the one that’s in the PS is the one that gets clicked the most. But I use a PS, sometimes there’s a PPS, sometimes there’s a like, infinity P.
James: How about, like, a story after the PSs? I think my friend Andre Chaperon is quite good at using that real estate. Laura: It really is great real estate. People like to scroll to the end. It’s just the same as when I pick up a magazine. I start from the back. I don’t know why. I feel like, I don’t have time for this whole thing, I’m going to start with the back page. So I think a lot of people just scroll right to the PS. They’ve got some good stuff there or something. James: You might be Japanese or something. James: I think they maybe read from the back, I’m not sure. Laura: I think they do. I have a whole lot of Israeli cousins, I think they start from that side too. I’m not sure. James: Yeah, whatever works, you know? I’m sure some people read upside down. Some of the famous people used to write in inverse to code their work. Need a mirror. Laura: I never knew that. James: I think Leonardo da Vinci used to write backwards. You’d need a mirror to read it. And someone will correct me if it’s not, but it makes a fantastic story. Laura: It does make for a good story, I’ll include that in my PS, which maybe I’ll put at the top of my email. James: How hard is it for people who are matter of fact to switch to story mode? And I’ll just preface that with, when I started telling stories it was quite unusual for me. My audience reacted very, very well. They started buying like crazy. And it came about by accident, because I’d actually gone for a surf and I was relaying this story to my surfing buddy who happens to be a Forex trader and a copywriter. And he was laughing and laughing. And then when I went home, I got this email from him that had my story. He’d written my story as an email. And I just cut and pasted it off to my audience and it was to sell tickets to my event. And that email sold dozens and dozens of tickets to my event. So it was literally a thirty-five-thousand-dollar email. And the subject line was something like, 7:33 AM I’m sitting there with my pants around my ankles. And boy, did that get opened. James: And it went on to talk about how I was actually at the public toilets across the road from my house, because the night before one of my kids had run out of toilet paper and put paper towel into the toilet and blocked it. And I had to call a plumber and it wasn’t fixed yet. And then I was just sort of pondering that no matter how bad my day was, I’m still going to go for a surf and my income is going to come in like normal and everything’s working great. I’ve got the team running properly and my customers are happy and there’s plenty of businesses out there who are really going to struggle that same day. My struggle wasn’t as bad as their struggle, and of course I bring in experts to my event to talk about how to have a great business and you should come along to it type. That was the call to action. And it was just really well received. And from then, I started writing the occasional story-based email, and for a bonus, for a product once, I actually wrote a new email pretty much every day. And I’ve never done this. I sat down and just typed out this long-form email with a story and a point. And one of the ladies receiving that said, “You should make this into a book.” And so some of those stories made their way into the final version of Work Less Make More. But I still do short emails as well. I still do very matter-of-fact ones. In fact, one of our highest open rates is a weekly digest that we send to our paid members, where we summarize the hottest discussions inside our community. And it’s actually calculated by our tool set. It actually works out the most commented, the most viewed, and puts it into order for us. And we send that out, and I call this long line fishing, but we’re getting close to 70 percent open rates for that email each week of our paid members to an audience of hundreds and hundreds of people. That’s basically, there’s no storytelling, there’s no real effort involved in that. So I guess there’s the range of high-effort emotional storytelling through to a somewhat mechanized process. But I guess if you were to look to both of them, they’re both really relevant for the person opening that email. So I wonder if you can talk about some elements of that. Laura: Yeah sure. I mean, I think that you always want to include some, you want people to expect that there’s going to be something entertaining or interesting in your email. And you could well write a weekly or daily or monthly newsletter that was just a roundup of things, of links, or things you liked. And people might open it every time, if it’s really good stuff, but they would never get to know you. They would never really get a sense of you and build that kind of, it wouldn’t build the same kind of loyalty that you do by making it personal and having some storytelling here and there. So you want to include some of that, but I think that it can be great to also include stuff that’s just informational, especially if your audience is hungry for information, or instruction, or something like that. I don’t think it ever has to be cut and dry. You know, you can say like, “Here’s the podcast that I listened to when I was stuck at the airport for 36 hours, sitting in my own filth, you know, charging my phone in the airport lounge.” Like, you can include little bits of story in anything if you’re so inclined. And I think people really respond to it well. I never send out anything that doesn’t have some bit of story injected in it, because that’s how I am. But if you’re more matter-of-fact person and that’s not what you’re into, you don’t always have to do it. James: So you’re saying you end up attracting an audience who are just like you? Laura: I do. I think you end up attracting an audience who have a kinship with you, who have maybe a similar worldview or that you’d get along with. I mean, your friends are not all just like you. Right? But you have things in common. James: I don’t think any of my friends are just like me. Laura: There you go. You might attract an audience of friends, and isn’t that what you want, really, like people who dig you, that you would like to hang out with? James: I think for me, I actually got once accused of caring too much by a boss of mine. But as a community founder and looking after, I’ve been the custodian, as Jay Abraham would say, of 600 odd people. I have to always think about their needs. And at the same time, 10 years out of a job, I’m just not going to compromise who I am. So it’s kind of that listen, this is who I am and I care about your results. You have to have to balance that out. I can see people have strong communities. Sometimes, they just become the person they need to be for that community, and other times they’re just who they are raw, and they just let the community attract around them. So I think this there’s a sliding scale there. I mean, I see this probably the most on social media. Some people probably overshare, and I think they’ve actually said, they’ve actually reached this point where they’re like, I’m not even going to live my life anymore, I’m just going to be a continual entertainment show because I’m addicted to dopamine. I think that’s happened in a few cases. James: And often, they’re not even hitting the ground commercially. They’re not getting the sort of numbers they should for the amount of presence that they generate. So they’re just, they’re actually, they’re a performer in a new world where you can get paid to perform with an iPhone. And that’s okay, there’s nothing wrong with that. I came more from a sort of solid, grounded business world, so that’s a far cry from general manager to documenting your day on a phone. So I’ve taken up Instagram and I’m doing that. But at the same time, there are limits to how much time and energy I’m going to put into that, because I want to actually live at the same time as earn. And that sort of actually, just before we leave the email topic, and you’ve been really generous with that, what sort of balance do you like to see between broadcasts that are fresh and automation sequences? Because I know that a lot of the market that you’re possibly working with, they seem to be quite formulaic. They talk about signature programs and automation sequences for funnels and those sort of things. It seems like it’s a big cookie cutter that gets sold for five figures over and over again. Is there like a standard package or prescription that gets rolled out? Laura: You know, I haven’t worked much on those automated funnels like on the standard cookie cutter ones, the Army-issue stuff. I think that at least for now, that stuff works. At least people say it works. I’m always amazed by it. But then again, a lot of them are selling to people who are, I think it depends – if you’re selling to an audience who are somewhat virginal and not so steeped in all this line, self dev, business course stuff, then they are fresh to that kind of funnel, and it probably has pretty sound psychological principles that gets them, that primes them and then entices them, gets them warmed up for the sell and then gets them excited to buy. And I think it really does work, especially if you have a fresh, virginal audience. However, if you’ve got jaded people, I think you’ve got to, you know, people have seen it all and have already been hit by all these funnels. I think you have to change it up. And I think that a sequence to sell something is great. Like, if you know which email, what sequence of emails works, then by all means automate it. Set it up and have people go through it. I am a big fan of the automated sequence. I myself really like a welcome sequence where, you know, you might call it a nurture sequence or a newbie sequence, but like, I have one that, from the moment somebody signs up for one of my freebies, they start getting welcome emails that build the relationship between the two of us. And it kind of assumes that they’re new, that they’re new to Talking Shrimp, that they’re new around here. It assumes that they haven’t necessarily even opened that freebie, and reminds them why it’s good and why they should open it up and use it, kind of checks in on them. Because we all, like, everybody just loads up on these freebies and they sit on your hard drive. You grab it, you’re like, ‘Ooh, I need that’, and you grab it and download it and then forget to open it up. So I like to remind them to open it, get them excited about what they just got for free. You always have to sell people what they already bought, right? And then there are a couple of get-to-know-you emails. I have an email that the subject line is, “Let’s not fake it,” like, “Let’s not fake it, James,” whatever the first name is. And it gives a whole bunch of, it’s kind of like an about page, which gives a whole bunch of weird kind of fun facts about me. And I ask some questions about themselves. And I invite people to write back, and people write back to me every single day, just shocked that I’ve invited them to write back, but they love to share things about themselves. And it really helps to build a relationship between me and the reader. And I think that they stick around longer and they’re more excited for my emails, like, what’s going to come next? James: Yeah, this was the big theme at the event I went to recently, was that you should have conversation with your customers, actually connect to them. That was a pretty shocking revelation for some people, and I was surprised by that, because for, I think, about seven years, I’ve been publishing my rant about these no-reply at emails. Like, you click on a link to buy a product and the page throws an error. So you reply back to the email to say, “Hey, guys, I think your page is down,” and it says, “Sorry, this is not manned. Go to our support desk.” And I’m like, screw you. They don’t want a conversation with the customer, and that’s just insane. I never understood that. And I get lots of replies to my emails, and usually it’s someone who would like to buy something and they maybe have a question, or they want to give me feedback and say something like, “I really enjoyed this episode,” or “That was one of the better ones,” or, “It would be great to hear more about blah blah blah…” I want that sort of email in my inbox, because that’s the best research that I could possibly get. You couldn’t pay someone to get better research than speaking to an actual customer. That was a really interesting conversation and I just want to sort of lead across to a side avenue here. As a freelancer, which I would put you in that category of, who is a specialist in a certain field, you’ve done some collaborations with some superpowers in our industry. What do you think are the keys that would help people establish relationships with powerful industry players? How do you build those relationships? Laura: You know, I mean I got lucky with Marie because I wasn’t looking for anything. Marie Forleo and I met in hip hop class at Crunch, back in 2003. She was just this annoying chick in my hip hop class. Like, insane sick body, outstanding hair, perfect moves. She was always upbeat and wanted to make it really fun. Someone said, you know, we’re going to do a striptease class and she’s like, can we wear costumes, make it really fun? It was like, “Can we make it really fun?” She just drove me crazy. And then one day, we started chatting and I discovered she was really nice, and to my disappointment, very likable. And so we formed a friendship. And that was like, years before I got into the online world. She actually got me into the online world, just by basically, showing me how to, she told me to put an opt-in on my website and to have a blog, and it all went from there. So that was luck in a way. But here’s what leads to my tip. Marie, like in around 2009, had a virtual program, I think it was called Virtual Mastery. And this was back when you could call a program Virtual Mastery and not have to specify what the mastery was in. There were so few courses out there. So it was this online program. It was a little vague to me what she taught or what it was, but I knew that maybe I had something to learn from her. I was feeling like I was in a business rut. And I said, “Do you think I should join your program, even though we’re friends? I don’t know, do you join a friend’s program?” She’s like, “Yes, of course you should.” And so I did, and I ended up helping a lot of people with their copy in the forum part of the program. This was before everything was in Facebook. It had its own built-in forum. And so Marie started to know me in a professional way, through that. She started to see my talent. Even though she knew that I was writing for TV, she knew that I was a respected copywriter and you know, good at what I did. And we talked about it when we’d walk home from hip hop. But this was her first glimpse of what I really could do. And she asked me to speak at her first live event, which is kind of what led to everything, what led to my business, because people started asking me, after I spoke there, to help them with their websites. Like, these were entrepreneurs who I’d never worked with before. They said, “Can you help me with my website copy?” I was like, “Sure, why not, I guess so.” That kind of led to this whole business that I have. So my point here is, like, having a mentor or taking other people’s programs, people that you admire, is a great way to get to know them. You would think that that’s not true, that they have way too many people to deal with. But if you’re really good and you’re generous in that program, I mean there’s almost always a community element to it, and show your talents and are generous with helping other people, I think you will get noticed. I think it is a great way to get noticed by these powerful people. And if you offer them a testimonial, if you are a success story, they will want to showcase you, but they’ll want a testimonial from you. And that’s a great way to get found. Like, if they post your testimonial on their site, other people associate you with them, other people look you up, browsing through their site. I don’t even want to know how much of my traffic was from having a testimonial on Marie Forleo’s site for years and years. So I think that that is one great way to form an alliance with somebody, really, is by hiring them or taking their program. It might feel like, ‘I don’t want to do that. I don’t want to pay. I don’t want to pay money to make friends with somebody.’ But it really is a good way to do it, and it shows them respect and they want you to be a success story. And I think that if you are, you end up having a relationship with them, becoming their peer. So that’s one thing that I recommend. And the other’s like, go to things. I am not a big events person. I don’t go to a lot of them, but when I do I’m glad that I did. I think, pitch yourself to speak. Even if you think you’re not a good speaker, you most likely know a lot that other people don’t know. I’ve used the word “virgins” a lot. I really believe in remembering the virgins. So you have to remember that you know so much more, most likely, than a lot of other people do. If you’re an expert in your given field, even if you think there are bigger experts, you’ve got something to share. So I’d say, pitch yourself to speak at things. And when people see you on stage, you become an authority. You become a little bit of a celebrity, a VIP, and other VIPs will recognize that and want to talk to you. I think people who overlooked me completely and didn’t look at me twice started paying attention to me after I spoke at Marie’s event in her Rich, Happy and Hot Live in 2012. And they hired me and became friends with me and promote me. So I think those are those are some good ways to get to know those powerful people. James: That’s excellent. I wholeheartedly agree with you. Some of my students have spoken at my event and become very wealthy as a result of that, or they’ve been on my podcast. They’ve been generous in my community, sharing tips. They just stand out. All of those things are good, and then I imagine once you get good clients, you get referrals and you get better clients and you just keep stacking on top. It’s like the who’s who of people who I coach in Silver Circle. James: Mostly referring other people to the program because they’re getting great results. So there’s almost zero marketing for that program, other than the fact that these people are in it. That is the number one compelling reason why someone wants to be in there, is because they know, like and trust that person, and them being in it alone is an endorsement of the program, because they know they wouldn’t waste their time. Laura: Totally. And you’re invested in their success. You want them to be success stories. It speaks for your program and gets more people into it. So you’re going to help them, you’re going to promote them if you can. It makes them look better if they are peers of yours, they become your peers. So it’s in your interest to be friends with them and for them to graduate to that level. Right? James: Remember, I care too much. James: I want these people to be more successful than they do, sometimes. I feel that that’s okay. There could be worse faults to have. James: And sometimes, your flaws could be really rich fabric for you to weave good stories from. Maybe you could share that with us. Laura: Oh sure. I absolutely believe in flaunting your flaws. I think they’re the best stories. I mean, I always talk about my weakness for food samples. That’s kind of a theme of mine. I actually, this might be narcissistic or paranoid, or both, but I really am convinced, like just today, that certain places in my neighborhood have stopped putting out food samples because I keep taking them. I’ve gone past, like, some of my usual places. My favorite bakery, and Citarella today, the supermarket where I shop, and they’ve both stopped putting out samples. I’m really sure because they saw me coming in too many times, I think I ruined it for everyone. James: Did you get fed when you were a kid? Laura: You would think not. I got fed. I was overfed as a kid, but you would think, if you hung out with me, you would think that I grew up like Oliver Twist, like a ragamuffin in the street begging for food, just the way I go around begging for it now. James: There’s programs that can fix that sort of thing. Laura: I know. But you know, I talk about that; I talk about watching too much TV; we all talk about our addictions to our phones. I talk about my laziness and how I like to sleep till nine or nine thirty. All kinds of things that I consider failings of mine. A lot. And people love it, because it gives them something to relate to. James: People are quite forgiving. I was a bit concerned when I was sharing with people about my surfing addiction, and they accept it. In fact, I think they want me to surf every day. I think that appeals to them, because they’d like to know how they can free up that amount of time to do whatever they like, whether it’s dance class or mountain biking or ice hockey, it doesn’t matter. I’m sure there is a sport or a passion that everyone has, they’d like to do every single day if they could structure their routine around that. I was quite happy that they’re okay with it, because I can hardly avoid talking about it, because there’s so many metaphors in it. It literally changed my life. Laura: Is it really something – let me ask you this, is it really something to forgive? Like, do you feel like you’re really confessing something when you talk about your surfing addiction, or is it more like, the flaw is when you wipeout. James: No, the thing that I’m conscious of is that they may not be interested in that, because a lot of my listeners aren’t living next to the ocean. They don’t have a wave pool in their backyard, yet. They will, mind you, there’s a big change coming. I’m just thinking it’s just not that interesting to them. It’s like, some of my friends talk about archery or other people talk about guns or whatever. Sometimes you think, well, that’s not why they’re there. In fact, there was a great example of this. My local surf photographer just went to a trip to India, and for a week or two, their pictures every day were now pictures from India – of the city and elephants and colorful clothes and things. But it wasn’t the surf pictures. And I felt like they weren’t really delivering to their audience what we’re there for. I signed up for surf pictures. I’m not interested in pictures of regional India in that particular context. It was out of place. But I think in my case, what I was surprised about is how they’ve really embraced it and they actually champion it and accept it and even they’re happy for me that I’m able to do this, and I can talk about it guilt-free. And it’s become aspirational for some. And in fact, some of them, like, they literally put their money where their mouth is. They buy a ticket to go on a boat in the Maldives with me talking about business for a week where we surf and scuba dive. So it’s become more than just talk. This is a way of living. So that’s the surprising thing, when you share a bit with your audience. Sometimes they’ll just accept you. Laura: Well, yeah. It becomes like an in-joke or something that they feel like, it’s an intimate detail of your life that they feel like they know, and they feel like they’re in your inner circle, because they know this about you and they know how much it means to you. So when you talk about surfing, in whatever email, they’re already along for the ride, and they’re like, oh yeah, I know this about him. I get this. I already get this about him. It needs no introduction. It’s not like, well, you know, I love to surf. You can just start off with like, Today, I had the perfect wave. And they’ll be like, Oh yeah, I know this. I know James loves to surf. James: They send me things now, like fins, leg ropes, and someone loaned me a board when I started. It’s fascinating how people rally around you. I found the same thing too when I confessed to them that I had osteoarthritis, which I was, believe it or not, I was almost embarrassed. In your 40s, you’re not supposed to be like the Tin Man, finding it hard to move. I couldn’t even turn my neck. But my community rallied around me. They got me DNA checks, they got blood tests, diet changes, fitness routine. One guy recorded in a gym a personal fitness routine for surfing for someone with osteoarthritis, with my DNA. This was Jonny Deacon. I mean, that just blew me away. I had the world’s first and only program of that type. And now I got full flexibility, I’ve dropped 10 kilos, that’s like 20-something pounds. I’m the fittest I’ve been in my entire life. My resting pulse is 55. And it’s all because of my audience resonating with the story which has been shared. You just can’t help but share stuff. Even what I talk about on a podcast like this. Someone will reply and say, “Hey, have you tried this?” Or, “You should check this spot next time you go to New Zealand,” or whatever. The people are just, they want to share and contribute if you’ll let them. James: I bet they send you food samples. Laura: Oh, man, I wish they did. I shouldn’t say this, but I’m going to. I am so grateful when people send me stuff that I like. Some people send me some really good stuff. But then other people, I’m like, have you not been…? You know, they’re fans. I’m like, have we not met? Because they’ll send me things that I make fun of. James: Maybe they’re doing it as a joke. Laura: I don’t know. Like, I talk about like how much I hate scented soap, and then people will send me scented soap. Maybe it is a joke. James: Well, that’s the ultimate re-gift, isn’t it? They’re setting you up for Christmas. Laura: Yeah, it is. It is. Maybe they didn’t even open it. They just smelled it and sent it along to me. James: If someone sends me equipment, I’m going to post it on Instagram. You know, it’s a win for them. The funny thing is, some my friends now are these, because that’s why I have this quirky Forex trading copywriter Californian is my surfing buddy through, he was a member of my community. That’s how we met. And it’s just great. Hey, we’ve had a great discussion about all sorts of things. Everything from relationships with celebrities through to emails that can get results and everything in between. It’s been really good to chat. My final question is actually around the name of your website, TalkingShrimp.com. I have to ask, what’s going on with that? Laura: What’s up with that? Someone wrote me today asking, like, “Why do you like shrimp so much? I think they’re like cockroaches.” Actually, I do like shrimp. But it’s really the most boring story ever, which is just that when my husband and I got married, our accountant said “You two should incorporate for tax purposes.” and, “Just come up with a name for your business, something that optimally has a free URL available.” So, you know, believe it or not, TalkingShrimp.com was not already snapped up. Laura: But I came up with a name that could apply to either of us. I’m in, you know, copywriting and communication, and he is in restaurants. James: I was going to ask, whoever the shrimp is has got to be getting a bad deal on this. I mean, we call it a prawn here. So that’s already a translation challenge. Laura: So you don’t use the word “shrimp” at all? Laura: Shrimp on the barbie? You would have said “put a prawn on the barbie”? James: That’s right. And also for the same reason a lot of people overseas think that we drink Foster’s in Australia. James: But we don’t. We hate it. Laura: So misunderstood and misrepresented. That’s terrible. Laura: So that’s the story of Talking Shrimp. But really, I do like the name. It’s sort of Purple Cow. Seth Godin Purple Cow sense that I realized later. Like, what stands out more than a shrimp that can talk? James: And from an SEO perspective, it’s very easy to own your own brand on Google for a name like that. Laura: That is true, though would you believe somebody took it for Instagram? And I had to have Talking Shrimp NYC. Laura: It is. They wouldn’t sell it to me either. Oh no, I didn’t try to buy it, but they wouldn’t give it to me. She had, like, 30 followers and a private account. Laura, it’s been wonderful. If you’re listening to this and you like what Laura had to say, go and check out TalkingShrimp.com. And it’s really been nice to get to know you. I’ve never met you before this call, we came through via an introduction, and we found some wonderful topics that I know will be helpful for a business owner. Laura: Thank you. It has been a pleasure. Maybe we will dance and surf together sometime. James: You haven’t seen me dance. Laura: You haven’t seen me surf. James: I surf better than I dance, and I’m not even a good surfer yet. That’s funny. Laura: A first for me. Thank you so much, James.